For all the family! This Sunday, 28th February, the first of two Shaping Laurencekirk community days is being held at Mearns campus (the new school). 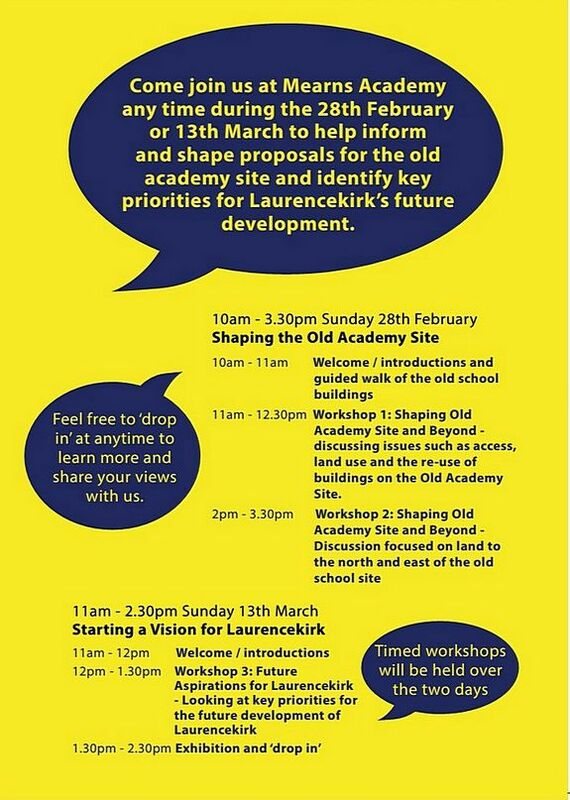 All residents of Laurencekirk are invited to come along and put forward their views on what should happen to the old Academy site, and how the town should develop in the future. The event includes a tour of the old school grounds, and there will be two workshops discussing possible uses for the land and buildings. If you don’t wish to attend the tour or workshops, then you can drop in to the campus at any time to find out more and to air your views. The tour starts at 10am from the community campus, with the workshops following at 11am and 2pm. The event ends at 3.30pm. You can find out more about this and the second community event (13th March) at shapinglaurencekirk.com, or on Twitter, #shapinglaurencekirk.